Technically curious heh? One of our pages has a message. Share the message with us when you call to schedule your service. 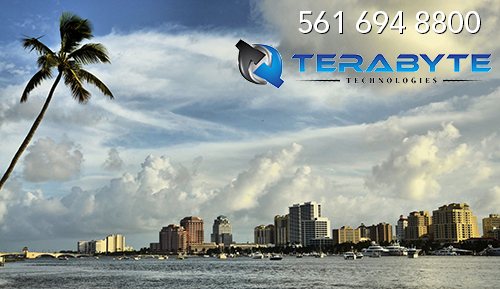 Terabyte Technologies is an award-winning provider of IT solutions to midsize organizations, founded and based in Palm Beach County. This local presence allows us to provide unmatched service response times for our clients. When you have a technical need that requires on-site service, we are literally around the corner. For more than 15 years, Terabyte Technologies has excelled at delivering technology solutions that optimize productivity, strengthen customer relationships, enhance data sharing and drive profitability. Our strong commitment to our clients has resulted in long-term relationships with some of the most well-known local, national and international firms. We look forward to offering you that same level of service for your exciting project. Please do not hesitate to call us directly with any questions you may have. Terabyte Technologies specializes in the technology solutions that match your needs including: managed services, hosted services, and colocation; infrastructure solutions such as Unified Communications, Microsoft System Center, virtualization and network security; software solutions including Microsoft SharePoint, business intelligence, CRM and custom development; and computer security. At Terabyte Technologies, we bring together high levels of IT expertise with a commitment to customer service. We are so committed to honesty and integrity that we have an immediate termination policy for any employee found to be actively deceiving any customer. We put our money where our mouth is... a policy that has served us well over the past 17 years. Most clients shared with us that finding an honest and capable IT guy was very hard to find. A lot of our clients had no idea what IT equipment they actually had, nor did they know why they were paying for it - besides the fact that their IT guys said so. We at Terabyte Technologies are different. We want our customers to understand geek. We want them to know what they are paying for and why - because every piece of equipment and line of code that we provide them is ensuring the longevity of their business and the strength of their revenue stream. Our customers are happy when they see us, and they are happy that we answer the phone when we need them. The Terabyte Technologies customer service is one of the best in the industry - just ask our customers! Our customers get help when they need it, know what they're paying for, and comfortable asking us questions. Most importantly: our customers know that their problems are as important to us as they are to them.